Description: Embellish your wrist with a beautiful floral bracelet that is sure to make a statement. 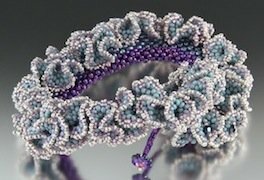 Begin with right angle weave (RAW) and combine it with peyote stitch ruffles to achieve the look of an elegant bouquet. Add the finishing touches with Swarovski crystals for that extra sparkle to create a special floral accent. Students learn how to hide the magnetic clasp to get the look of a true bangle bracelet. This work of art will truly be yours as no two pieces are exactly alike.